Srimad-Bhagavatam, also known as the Bhagavat-Purana, is an epic philosophical and literary classic and holds a prominent position in India’s voluminous written wisdom. 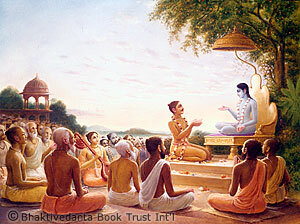 The Bhagavatam is the postgraduate, post-Vedic text of spiritual understanding. It has served as the inspiration for countless works of literature, song, drama, painting, and sculpture. Known as “the ripe fruit of the tree of Vedic literature,” Srimad-Bhagavatam is the most complete and authoritative exposition of Vedic knowledge. Covering everything from the nature of the self to the origin of the universe, it touches upon all fields of knowledge. Vyasadeva compiled Srimad-Bhagavatam after Krishna left this world 5,000 years ago. The 18,000-verse treatise centers on the science of God and devotion to Him, and includes biographies of great devotees who followed the path of Bhakti and attained Krishna. The first verse of Srimad-Bhagavatam makes clear that the book is intended for people serious about spiritual progress; it will not deal with sectarian religious ideas, philosophical conjecture, or worldly concerns. The second text promises that anyone who reads the book systematically will achieve the spiritual success meant for all human beings.